Peter Elliott was going to be an NFL wide receiver. Hands down. Nobody in the fourth grade caught as many passes as he did during recesses at Everett Elementary in Lake Forest. With his precise route-running and Velcro-reliable mitts, Elliott made nine-year-old quarterbacks look All-Pro great in the middle of school days. “Peter,” recalls that his twin, Will, “always caught the long ball, always caught those 20-yard passes. Peter Elliott dropped his plan to be a star professional football player four years later. Maybe he would write about sports rather than talk to sportswriters after games. As an eighth-grader at Deer Path Middle School, he was already nearing veteran status with Talking Baws, primarily a Scottish soccer website. His Talking Baws title: Lead NFL, MLB and High School Football Writer. In the fall of 2016, Lake Forest College football coach Jim Cantanzaro asked Elliott if he’d be interested in conducting and producing a weekly pregame show for the LFC football team. It would entail interviewing coaches and players. LFC had held a camp for football prospects at Willowbrook High School months earlier, and it was there where Catanzaro noticed a certain youngster acting adult-like and professionally. Elliott interviewed the prospects and filed reports/posts for various outlets. Elliott jumped at the opportunity to cover LFC football without having to type snappy, informative sentences for his readers. For a Creative Arts project in eighth grade, Elliott and a couple of his eighth-grade classmates turned in a sports documentary. The students interviewed sports journalists and others and asked each to select the 10 best NBA players of all-time. Each subject also was encouraged to support the selections with statistics and opinions. Stephanie Elliott convinced her go-getter son to go out for cross country at LFHS in the fall of 2017. He struggled at the outset of the preseason summer camp, but he settled in gradually as he bonded with his frosh-soph teammates in the grueling sport. 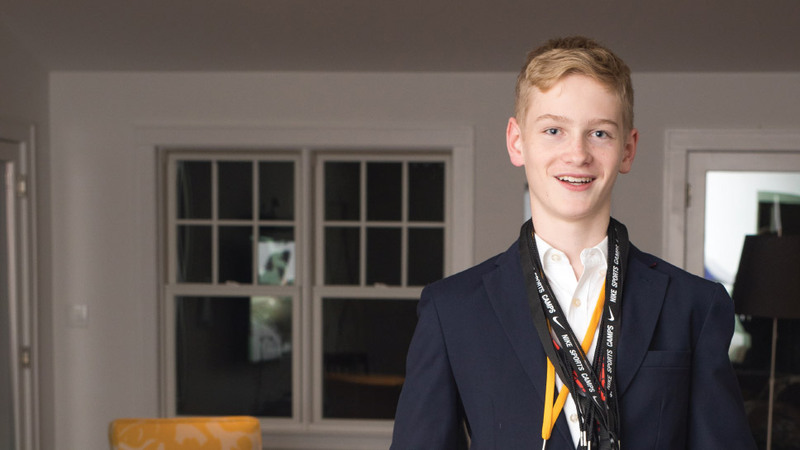 While juggling academic and athletic commitments in his first few months in high school, Elliott connected with a Chicago-based magazine/website, College Football News, enabling him to secure press credentials for Northwestern University home football games in Evanston. The fearless 14-year-old worked in a press box and attended press conferences following NU’s games against Nevada, Iowa and Minnesota. Crossing paths with sportswriters from Chicago’s major daily newspapers and familiar scribes from other outlets thrilled the former recess football legend at Everett Elementary. “I was, by far, the youngest person in the press box and the youngest person asking questions after the games,” says Elliott, who received his first box of business cards (PETER ELLIOTT, SPORTS REPORTER) in May. “The next-youngest at the football games were the writers for Northwestern’s student newspaper. Will wouldn’t be surprised if his twin ends up editor-in-chief of ESPN.com someday. Then again, would anybody be surprised? Such a position requires sports fanaticism, ambition, intelligence, creativity, perseverance, and adaptability on the fly.